One of Alaska's northernmost ports has seen a significant bump in traffic in the past five years, as melting sea ice has helped more vessels, both commercial and recreational, traverse the Arctic. 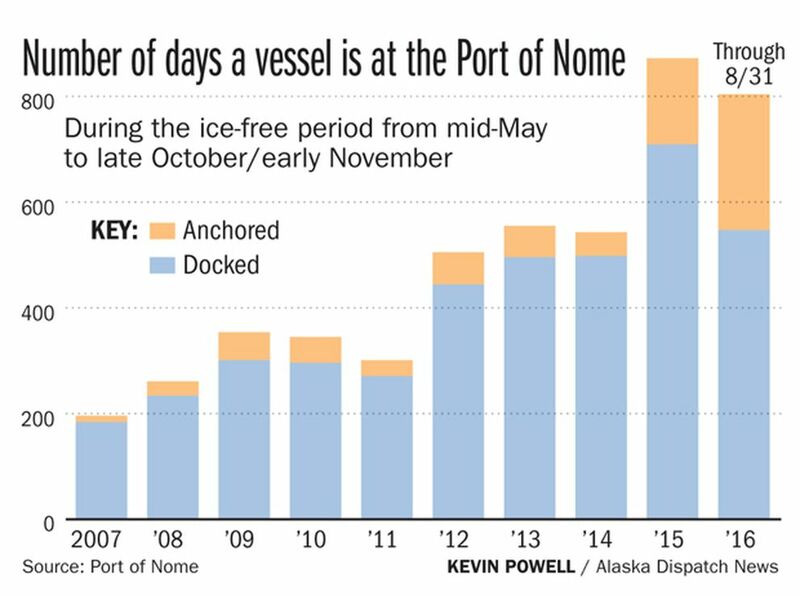 The Port of Nome has seen a spike in docked vessels since 2011, and growth in traffic anchored at the port since 2014. That counts seasonal traffic during Nome's ice-free period, which usually lasts from mid-May to early November. Increasing traffic at the Port of Nome comes from several areas, Port Director Joy Baker said. Those include more research vessels, fuel and cargo transport and distribution, tourism and private sailing vessels, and government ships. She said activity in the region has been growing since 2007. "The port's growth is partially attributed to the Arctic, the traffic increased in the Arctic," Baker said. "That's been an ongoing discussion here for at least the better part of a year, year and a half." That also means the port, a Western Alaska hub for distributing fuel and cargo, and a crucial point for fishermen, gold dredgers, researchers and, increasingly, tourists, has to add more space, Baker said. It completed construction of a third dock last year to help alleviate traffic congestion, and is hoping to eventually become a deep-draft port to be able to handle larger ships that sit deeper in the water. "We have always been the hub for the region and that role is even more prevalent today," Baker said. Numbers from the Marine Exchange of Alaska, which tracks traffic in Alaska's waters, show that the total number of transits through the Bering Strait — the choke point between the Pacific and Arctic oceans — have increased significantly since 2009. That year, the total number of northbound and southbound vessel transits through the Bering Strait was 262, according to the Marine Exchange, and remained roughly the same until 2012, when it jumped to 316. After dropping back down to 255 in 2014, the total number of transits through the strait last year was 452. Ed Page, executive director of the Marine Exchange, said those fluctuations are largely attributed to Shell's start-and-stop exploration efforts in the Arctic. Not all of those vessels stop at the Port of Nome, and some are too big to dock there at all. Some are passing by, and others drop anchor away from the dock, while goods and passengers are then transported to shore using small boats or helicopters. 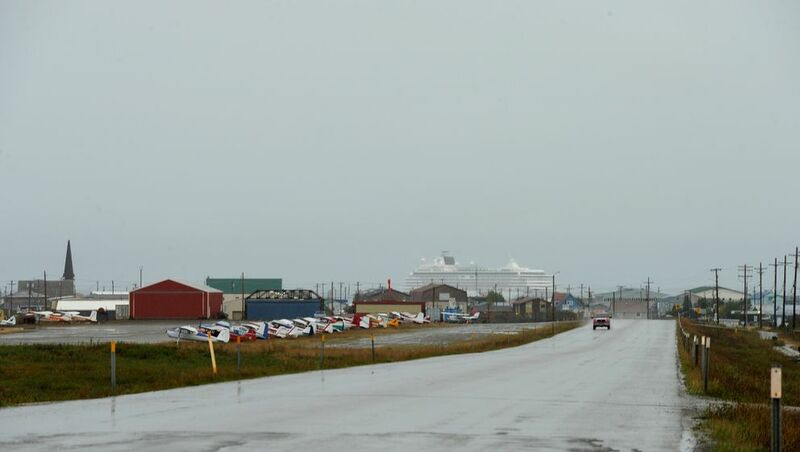 When the Crystal Serenity, the largest cruise ship to visit Nome, traveled there this summer for the first time, it anchored away from the too-shallow dock and transported passengers ashore with smaller boats. "Until now, the Arctic has been pretty much closed for business. It just started to be a new maritime frontier," said Page. He said he's working with the Nome port on a study to ensure safety there "as maritime operations increase." 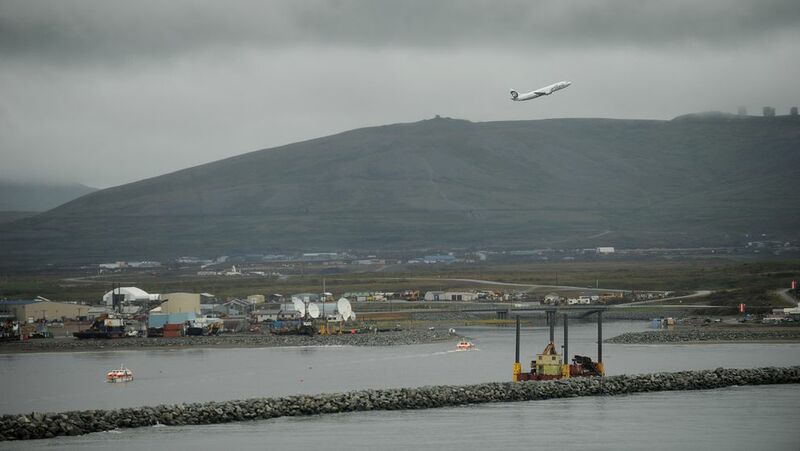 Traffic for vessels docked at the Port of Nome grew from 271 dock calls in 2011 to 709 in 2015, and anchored traffic exploded from 30 to 369 during that time, according to numbers provided by the port. The number of calls isn't equal to the number of ships. One ship docked at the port for a week would count for seven dock calls, for example. But Baker said the number of vessels coming through the port is also "ballooning." And the increase continues this year, the city of Nome said in a document about plans for port expansion. "The bulk of the 2016 increase is directly related to more foreign fuel tankers, research vessels, domestic & foreign government vessels, gravel and cargo," the city said. That growth is good for a region where port activity is a big economic driver — Nome has about 3,800 people — but it also brings "great risks without the infrastructure to support the needs of the larger vessels," the city said. The port's capacity may change dramatically in the future, depending on what happens with a U.S. Army Corps of Engineers study about possibly developing the deep-draft port there. Baker hopes for dredging the existing outer harbor, which is 22 feet deep, to a depth of 28 feet, and then expanding the port to include a deep-water dock basin 35 feet deep. A driving factor behind wanting to accommodate larger vessels is the hope of cutting operating costs for the maritime industry working in the Arctic, which people in the region hope will translate to lower transportation costs for commodities into the Nome region, the city said. "We bring in fuel several times a year off barges," said Scot Henderson, CEO of Bonanza Fuel, a subsidiary of Sitnasuak Native Corp. "If we have a deep-water port, we can bring in larger vessels at a time, and instead of supplying the community two to three times a year, we could potentially resupply once a year. There's a lot of benefits for that." Transporting fuel, freight and gravel are the "main sources of revenue and activity" at Nome's port, according to the Port of Nome Strategic Development Plan, which was put together for the city in January by the McDowell Group. Another area of growing activity is in the gold-mining fleet offshore of Nome, according to the McDowell Group. That fleet "has increased drastically in recent years, rising from five in 2008 to 100 in 2015," the report said. Some of the added activity in the Nome region this year also comes from Quintillion Subsea Operations, the company running a fiber optic cable project that aims to bring high-speed internet to rural parts of Alaska. Ships were stationed in Nome to lay cable on the seafloor this summer. "The growth of the traffic — we've still got naysayers telling us, 'You guys are dreaming, there's never going to be an Arctic port,' " Baker said. "I beg to differ. … Things are changing, the traffic has grown considerably. We are extremely busy from our peak July, August, September months. Now June and October are getting busy." Nome sits a bit more than 100 miles below the Arctic Circle. The harbor in Nome is already overcrowded, according to an Army Corps report from February of 2015. But when Shell pulled out of its drilling operations in the Arctic, it cast a shadow of doubt over growth at northern ports in the future. "I think it's kind of in a holding pattern because the increased maritime activity people were anticipating largely related to Shell's efforts didn't materialize," Page said. The corps put a "12-month pause" on the feasibility study in October of 2015 to "revalidate potential project economic benefits and justification," the agency said in a news release a month after Shell ditched its Arctic exploration. The agency was also looking at Port Clarence and other sites for further development, but "the Port of Nome was identified as having the greatest potential for initial Arctic port investment," the Army Corps said in that same release. Dena O'Dell, a public affairs specialist with the Army Corps of Engineers, said last week that study is still on hold and the agency is "awaiting guidance from our headquarters on how to proceed" with the study. Part of that wait, Baker said, has to do with federal legislation working its way through Congress that would provide guidance about how to move forward with developing a deep-draft port in the Arctic. The Water Resources Development Act "instructs the U.S. Army Corps of Engineers, in carrying out the study of the feasibility of an Arctic deep draft port, to consult with the Secretary of Homeland Security and the Secretary of Defense to identify national security benefits associated with an Arctic deep draft port and use that as a basis for determining feasibility," said the office of U.S. Sen. Dan Sullivan, R-Alaska, in a statement in September. The port is working with the Corps and the state's congressional delegation to move that effort forward, Baker said.